This is my first post since the massive earthquake and tsunami hit northern Japan in March 11, 2011. Although it’s a part of my job to promote Aomori tourism, honestly I couldn’t really write “Come to Aomori for sightseeing!” while suffering from thousands of tremors in these 2 months. 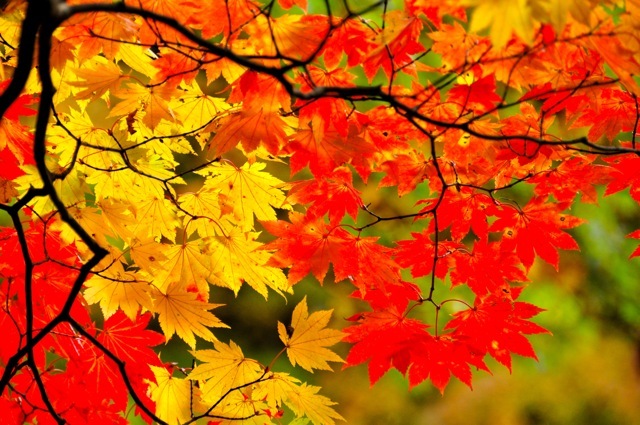 Finally, the earth seems to be calm down and I am glad to resume this blog. Japan is trying really hard to have our normal lives back. Here is one encouraging example of quick and great restorations! East Japan Railway repaired the seriously damaged facilities and equipment of Tohoku Shinkansen line, and full Shinkansen service between Tokyo and Shin-Aomori has been restored from April 29. 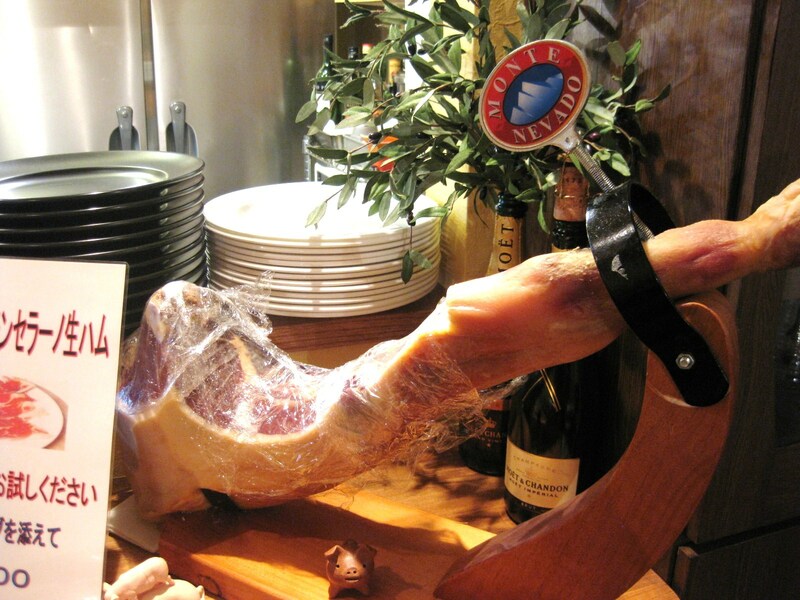 Now I can introduce this unbelievably reasonable offer for foreign tourists! 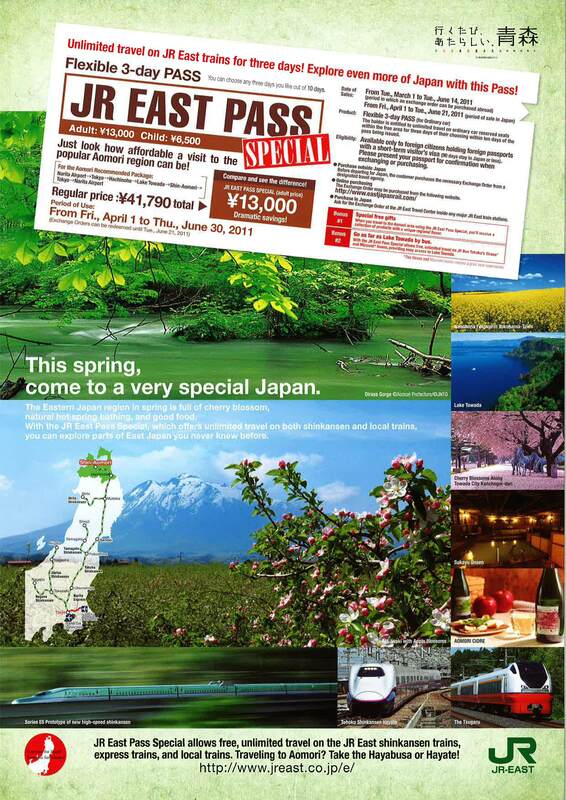 JR East Pass Special valid until June 30, 2011 allows you to travel throughout East Japan on the JR East Shinkansen trains for 3 days. The price is only 13,000 yen! FYI, usually I can’t even buy the one way Shinkansen ticket from Shin-Aomori to Tokyo with only 13,000 yen as Japanese….I wish I could be a foreigner until the expiry date of this pass! Please check the detailed info by clicking the following image. 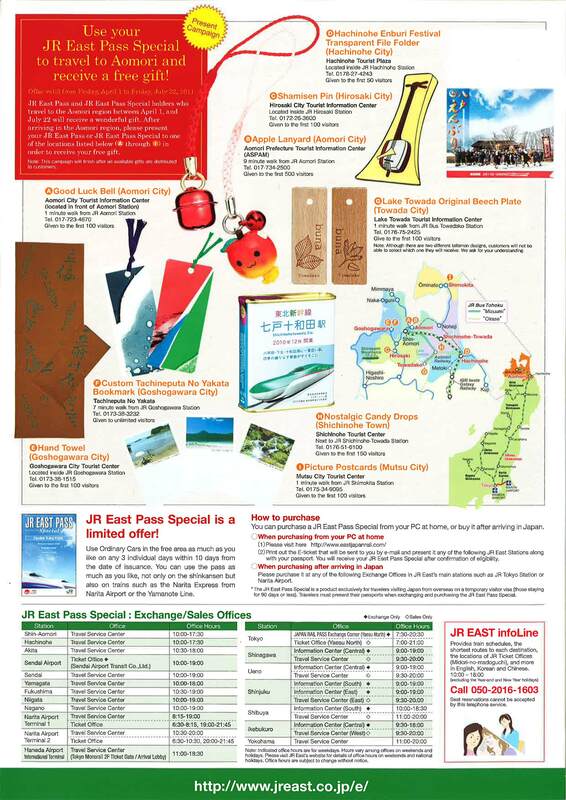 Once you stepped on a ground of Aomori Prefecture, please don’t fail to present your JR East Pass of JR East Pass Special at the designated Tourist Centers to receive nice gifts (for details pls click the following image). Only the first 50 – 500 visitors would be eligible to receive those gifts. Hope you can make it. The weather is getting nicer in Aomori, and Japanese tourists start visitng Lake Towada, Lake Juniko and Mt. 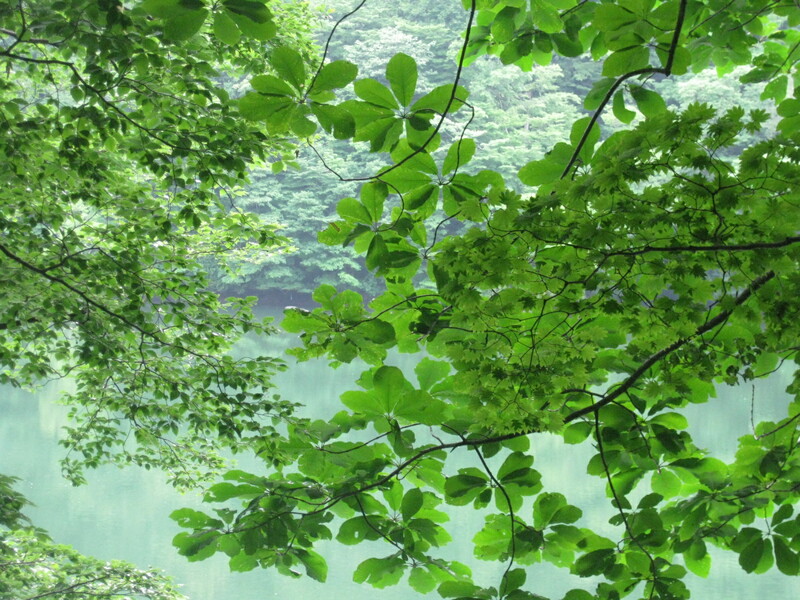 Hakkoda to experience lush greenery and fresh air. It’s still snowing in Aomori-City. For locals dealing with cold and long winter, soaking in Onsen (hot spring) is utter bliss. There are many Onsen scattered throughout Aomori, and if you are a Onsen lover, Aomori is definitely worth visiting for Onsen outing. 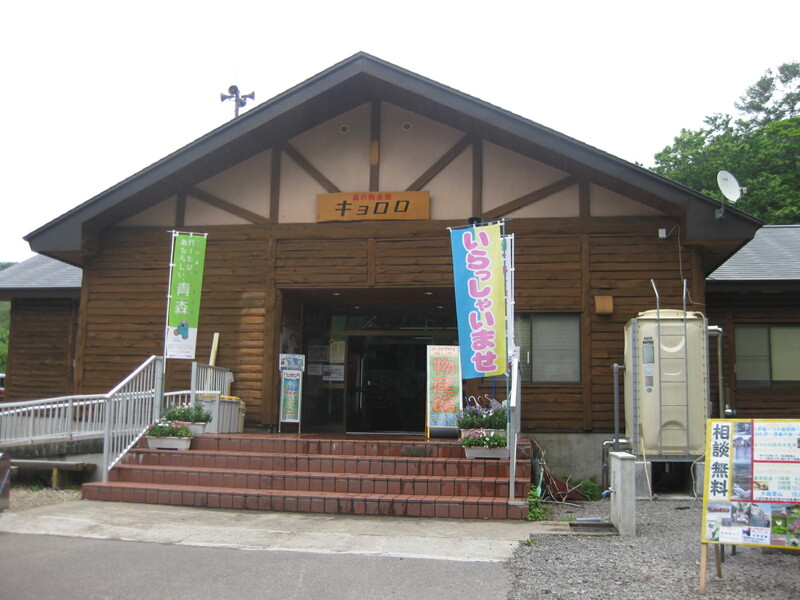 Here is my first Onsen post in this blog, a popular hot spring you can visit from JR Shichinohe-Towada station. Tohoku Onsen is proud of the color of their hot spring as the most “blackish” in Japan. The U.S. Air Force base is located in Misawa-City which is about 30 minutes from Tohoku-Town, and this hot spring is getting popular among military people stationed in the base, and also foreigners living in Aomori. The very first thing you do in Japanse Onsen places is buying tickets from a vending machine. You can also buy shampoo, tooth brushes, razers and everything else you need to take a bath. So most of the time it is okay to visit Onsen places empty-handed (but bring your wallet). 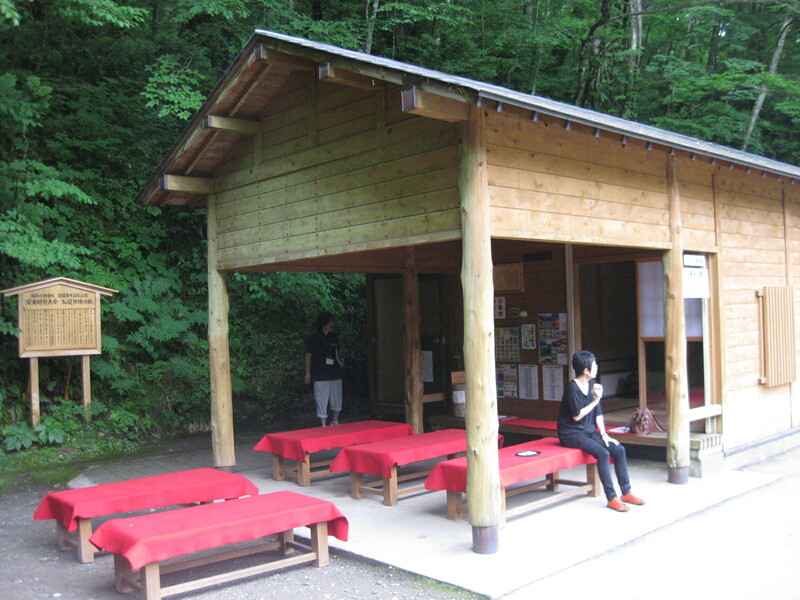 This is the public hot spring bath for ladies. Looked clean and tidy. 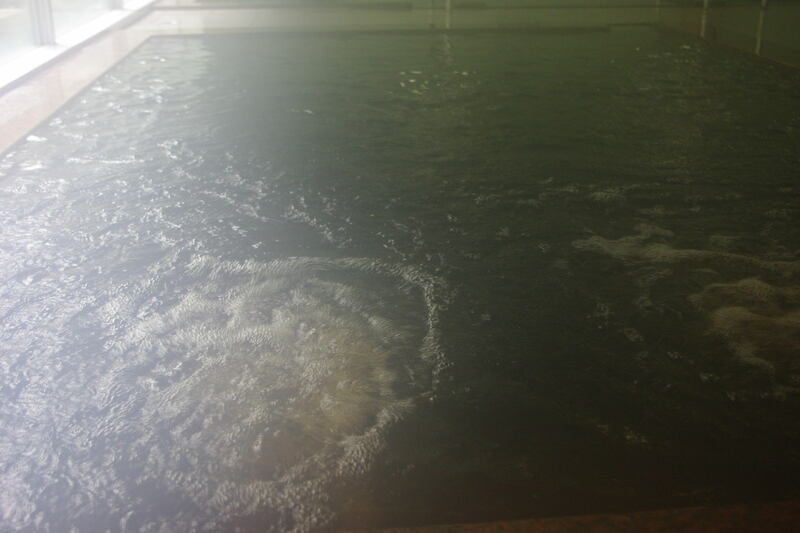 A close view of the hot spring – not a clear picture because of the steam, but can see the hot spring appears black. 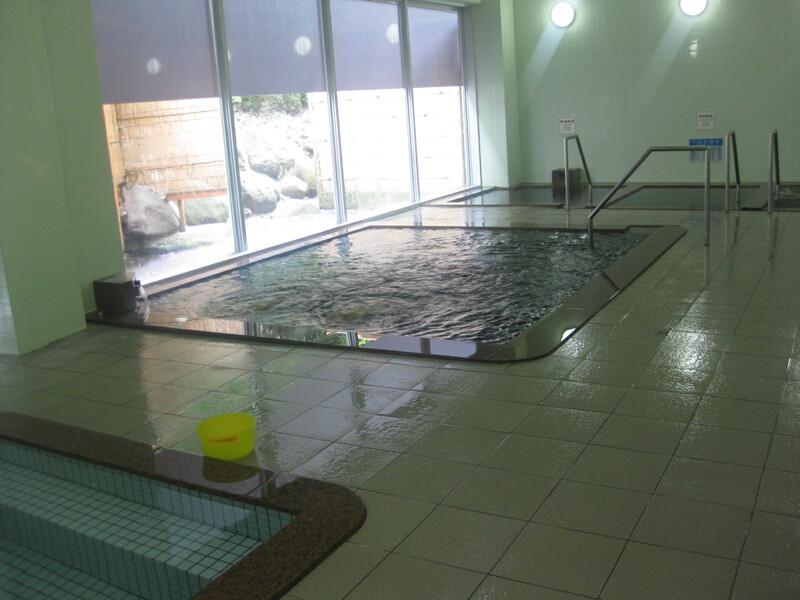 This hot spring is said to be effective for neuralgia, exhaustion, cold hands and feet. 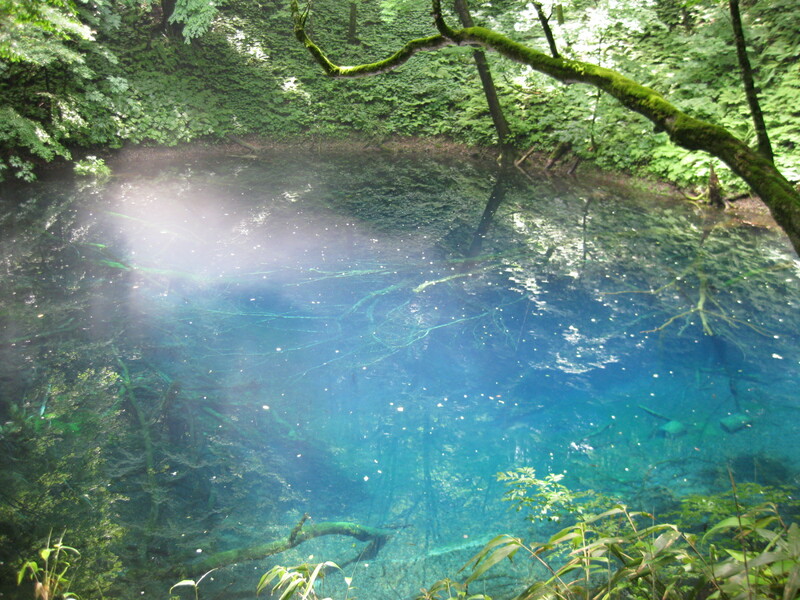 This hot spring is called ”Moor hot spring”. Moor is literally low-rank coals in German. The moor hot spring water gushes out through the lignite layer. For those who are too shy to jump into the public bath, or prefer to take a bath only with your loved ones, “Private Family Bath” is available (1,200yen / hour). The bathtub of Private Family Bath – this ceramic bathtub is made of Shigaraki pottery, one of the famous pottery types in southern Japan. For the visitors to enjoy this hot spring thorougly, Tohoku Onsen also offers accomodation. Signboards are written in English, Chinese and Korean for foreign guests. Very nice. The building has been remodeled in April 2008, and guest rooms are clean and cozy. Wired internet access is available in each guest room. 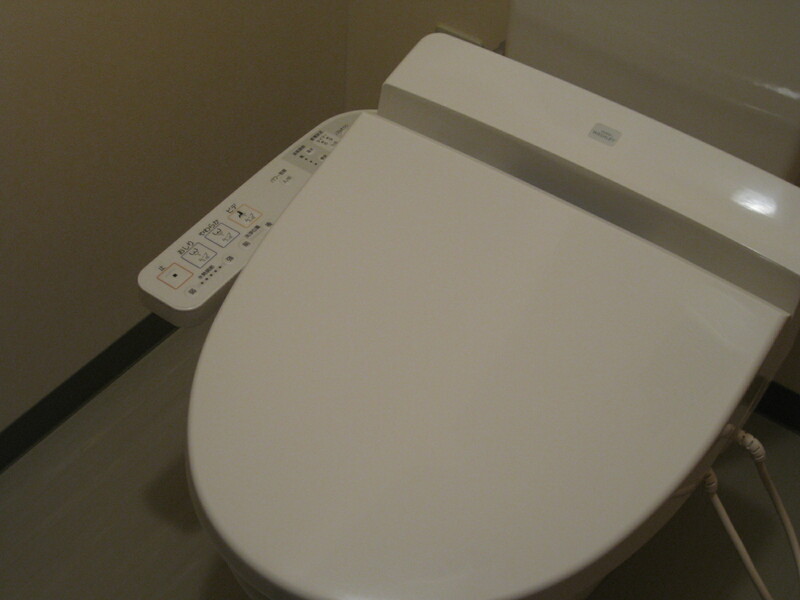 BTW I heard many foreign tourists are interested in the washlet toilets, Ta daa – glad to tell you that the guest rooms have washlet-equipped toilets. 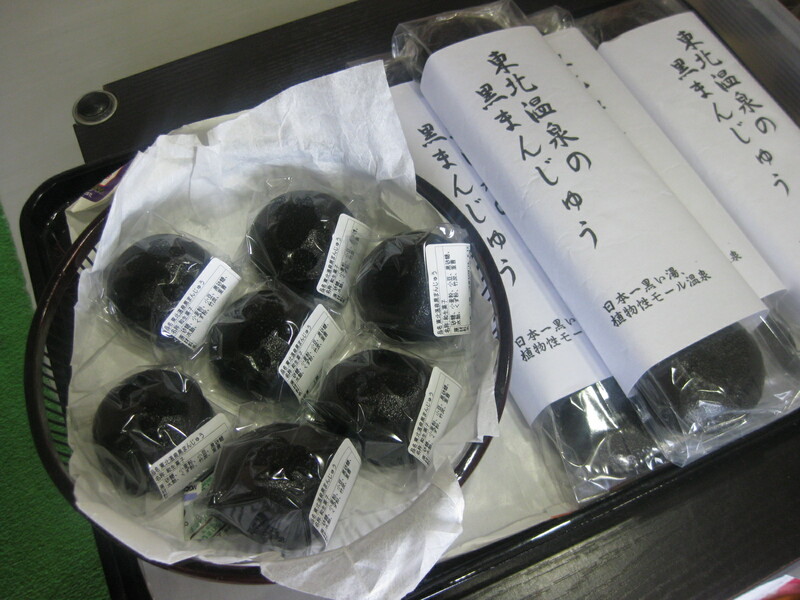 If you want to buy some gifts for your friends or family, how about this black Japanese sweets(sweet bean paste in black steamed bun)? 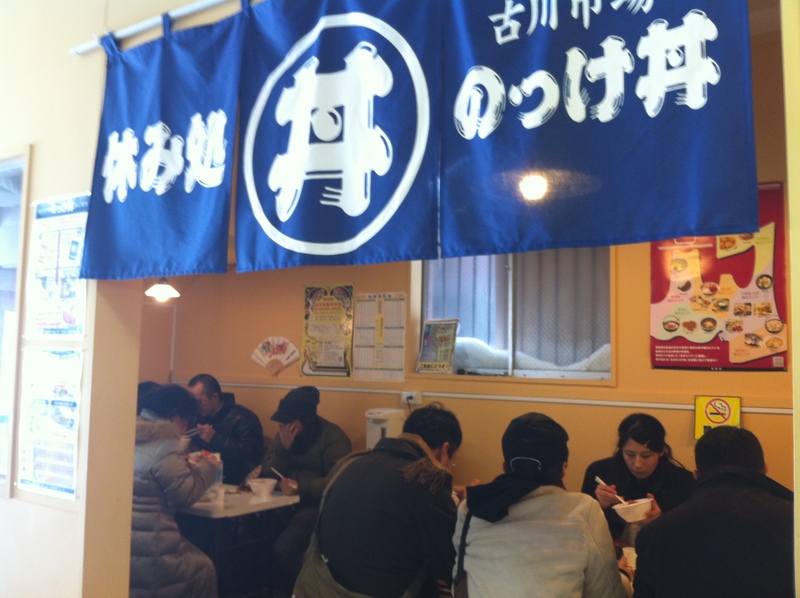 Free courtesy car/bus is available between Tohoku Onsen and JR Shichinohe-Towada station by making a reservation. 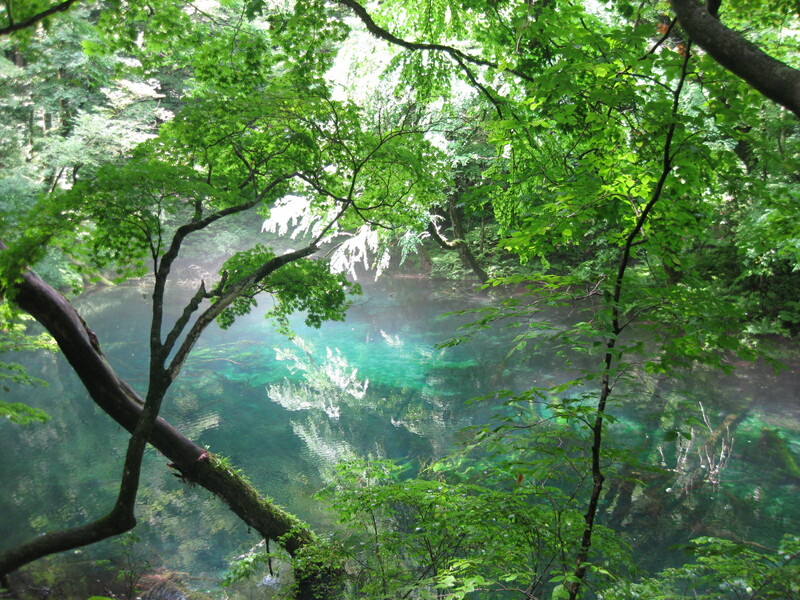 Please come and enjoy many interesting and rare hot spring in Aomori-Prefecture. I will be posting other amazing hot springs in the future post. 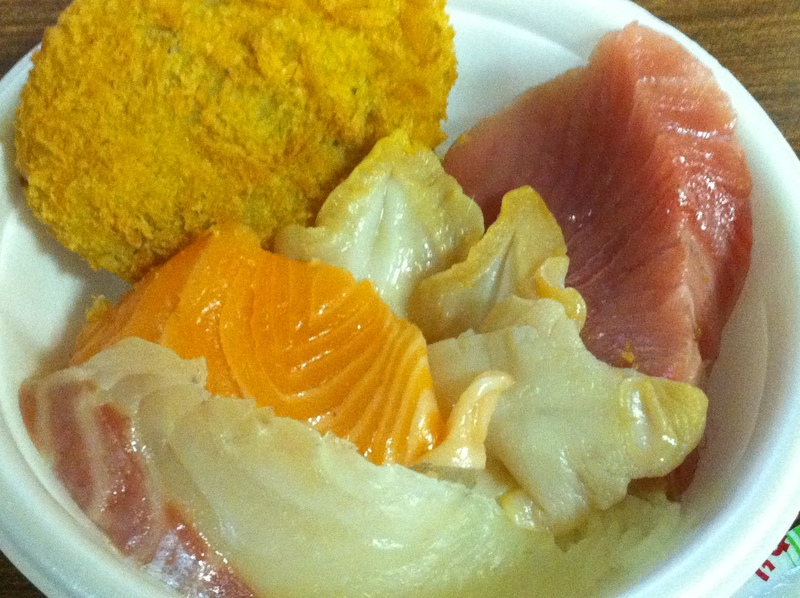 Wanna Devour Sushi Bowl at the Fish Market? So now you can come to Aomori-City from Tokyo by direct Shinkansen service!! I have to tell you that the new JR Shinkansen station, Shin-Aomori station is located in the suburbs of Aomori-City and tourist attractions are still centered around JR Aomori station. February is the worst month for winter weather, and if you are not a enthusiastic skier or snowboarder but happened to visit Aomori in this season, I recommend you to find indoor activities easily accessible from JR Aomori station. BTW do you like Sushi? If so I’d like to introduce a very popular spot for lunch where could be one of the fun places to visit. Uh, no English signs…but this red signboard and the blue flags will help you to find this building. 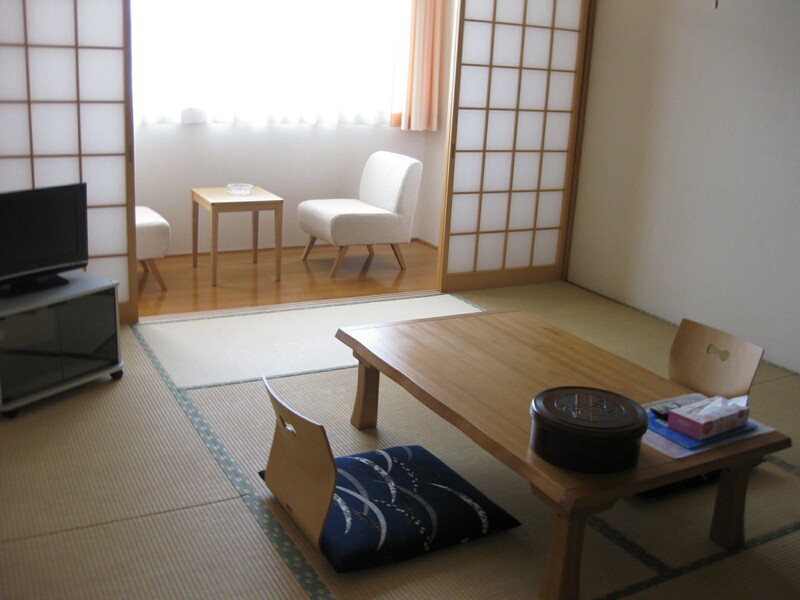 It’s only 6-7 minutes walk from JR Aomori station. 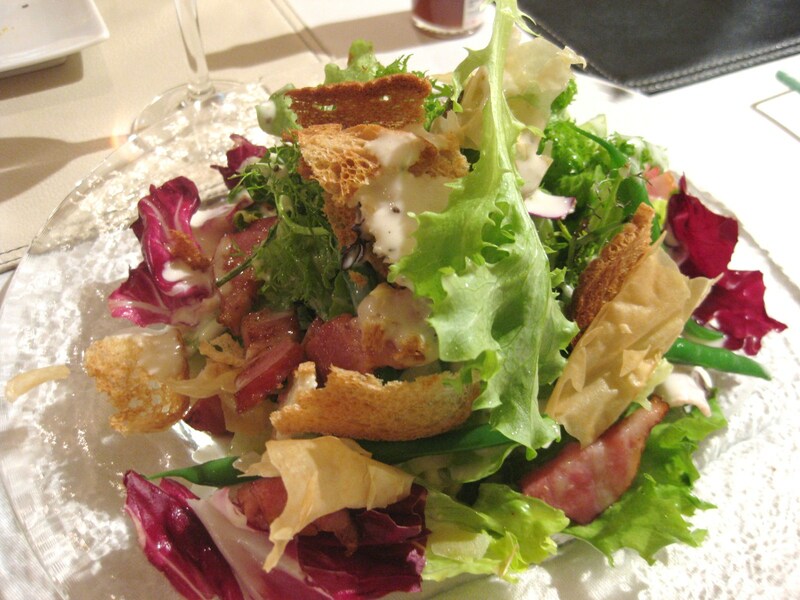 This is “Aomori Gyosai Center”, literally Aomori fish & vegetable center. Let’s get inside…this fish & vegetable market has 3 aisles and consists of 38 shops selling freshly caught fish along with vegetables and cooked dishes. 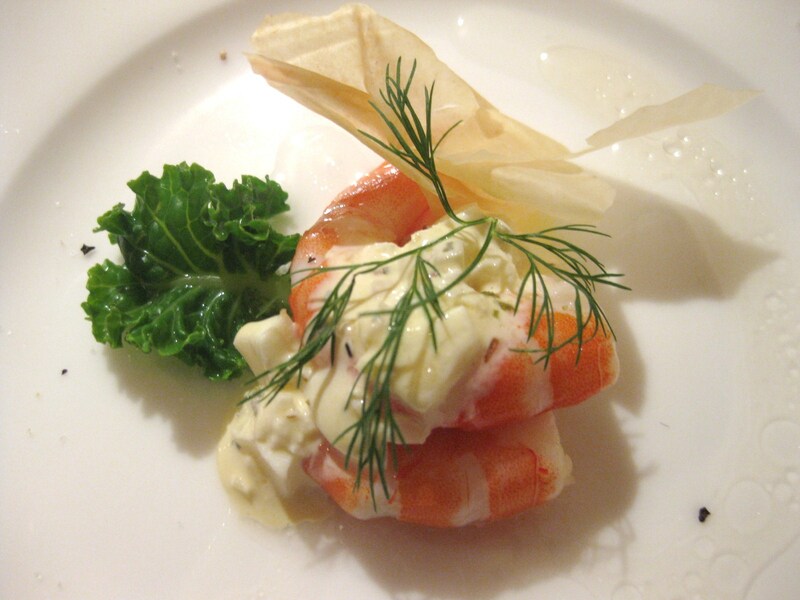 If you are a sushi or sashimi lover, you will find out this place is a dream restaurant as you read this article. 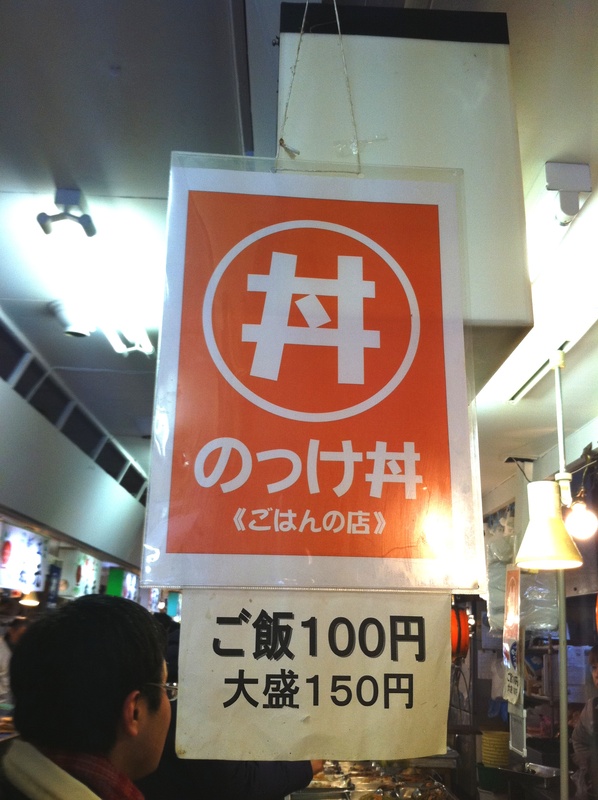 First, find one of the three shops hanging this orange sign where you can buy a bowl of rice (regular: 100 yen / large helping: 150 yen). 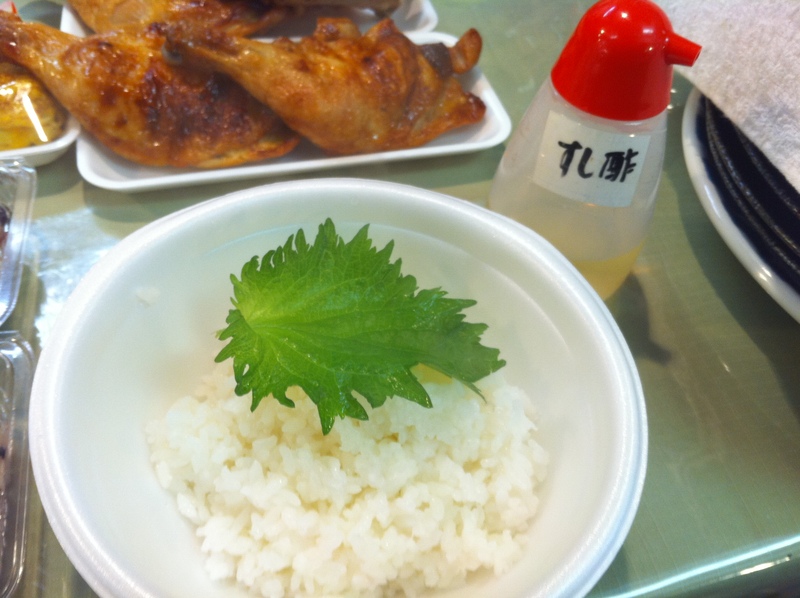 This is a regular rice bowl with an optional topping of Shisho(perilla) leave(10 yen). You will occasionally find Shiso leaves in Japanese cuisine as a garnish or for flavoring. Shiso is known with its antibacterial effect and that’s why sashimi is always garnished with Shiso. I simply like the taste of Shiso. 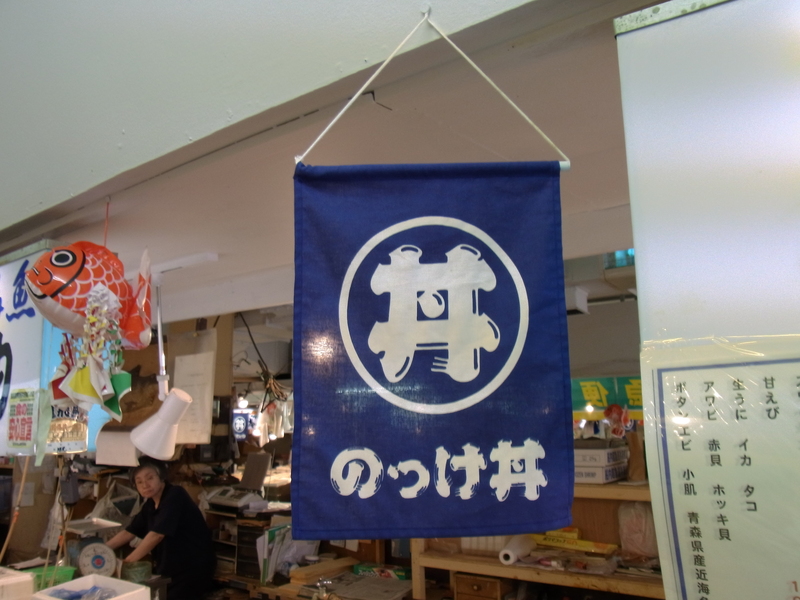 Next, go around all the shops and find this blue flag, which means the shop is selling bite-sized slices of raw fish, fish roe, scallop and other seafood delicacies. Just point at the items you want to buy, and if you can say “Kore kudasai(I will take this)”, that will help to communicate smoothly with the sellers. 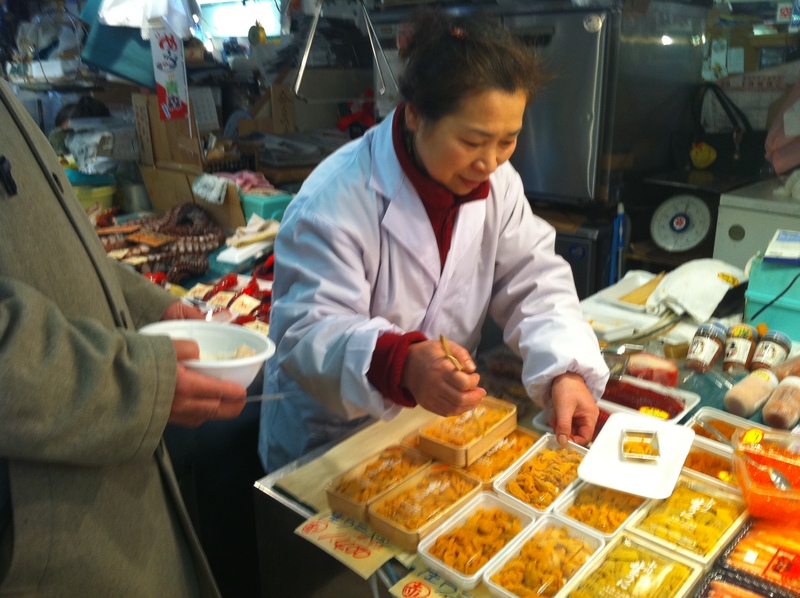 The seller puts what you pointed in your bowl, and you pay by cash right after you buy something. Basically you can buy 1-3 slices of fish meat with 100-300 yen(depend on the kind and quality), 1 scallop with 100 yen and 1 small container of sea urchin with 200-300 yen. And this is my Sushi Bowl I made for myself ……ta-dah!!!! My Sushi Bowl cost ONLY 1,100yen. Unbelievably reasonable!!! 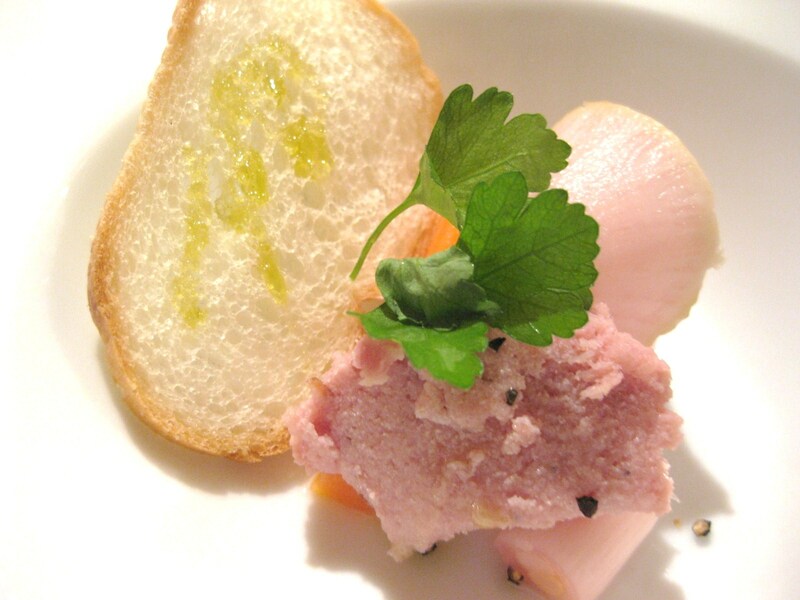 If you eat this in sushi restaurant it will definitely cost 3,000 yen!! After completing your customized Sushi Bowl, you have to find a place to eat. Tables and chairs can be found between the shops and at the corner of the building. I couldn’t get my seat at the most comfortable eating area because all the seats were full….wow. But I could find the table next to the shop. 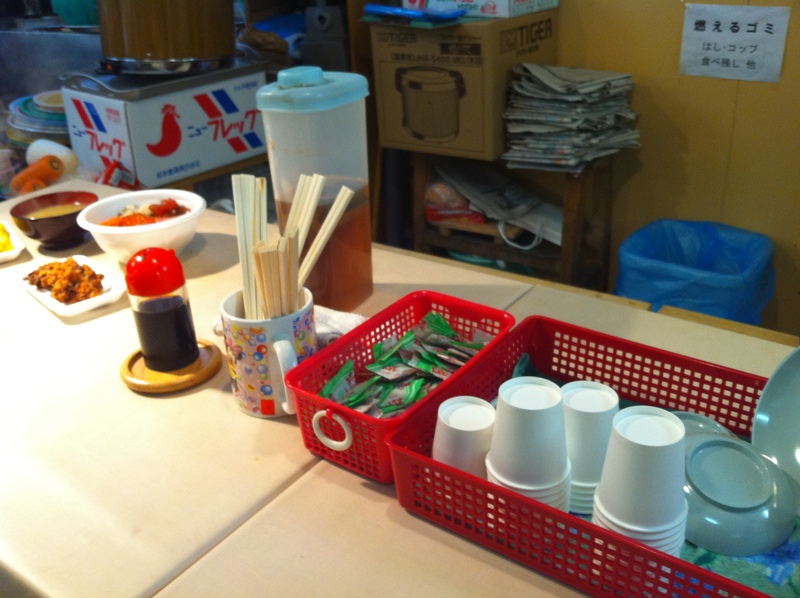 Chopsticks, soy sauce, wasabi, tea, paper cups are provided on the table. While I was writing this blog at the office, my co-worker saw the image of my Sushi Bowl which made his mouth water (haha). As he was eager to go to this market for lunch soon, we actually visited this market today. I know my Sushi Bowl for today is totally different from the last one and not decorative at all, but I wanted to tell you that you can also buy cooked food like crouquette or crab cake for your Sushi bowl. It cost me only 670yen. 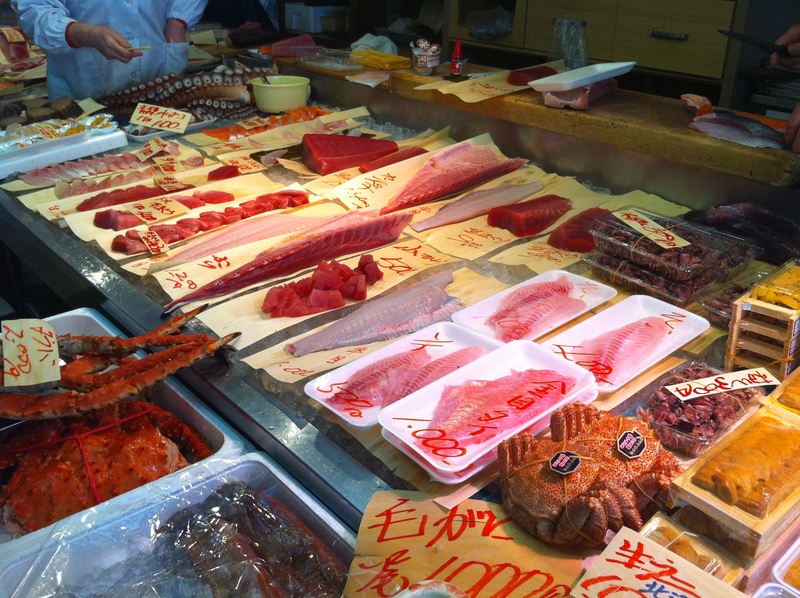 Do you think 300 yen for 1 piece of fatty tuna is a bit pricey? No it’s not. 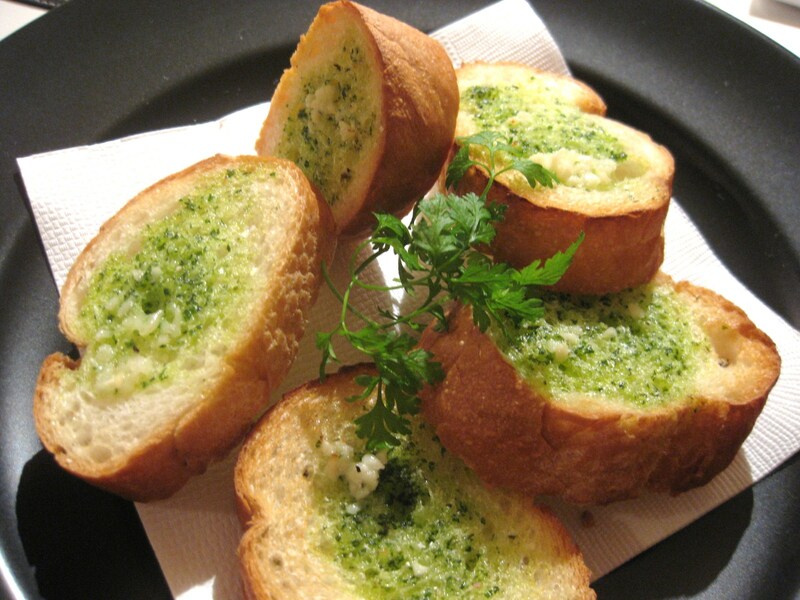 If you eat this at a Sushi bar you will obviously be charged over 1,000yen. If I didn’t buy the fatty tuna, I could make my sushi bowl even more cheaper. So it’s up to you how much you want to spend for your Sushi Lunch Bowl. I said this market is a dream restaurant. 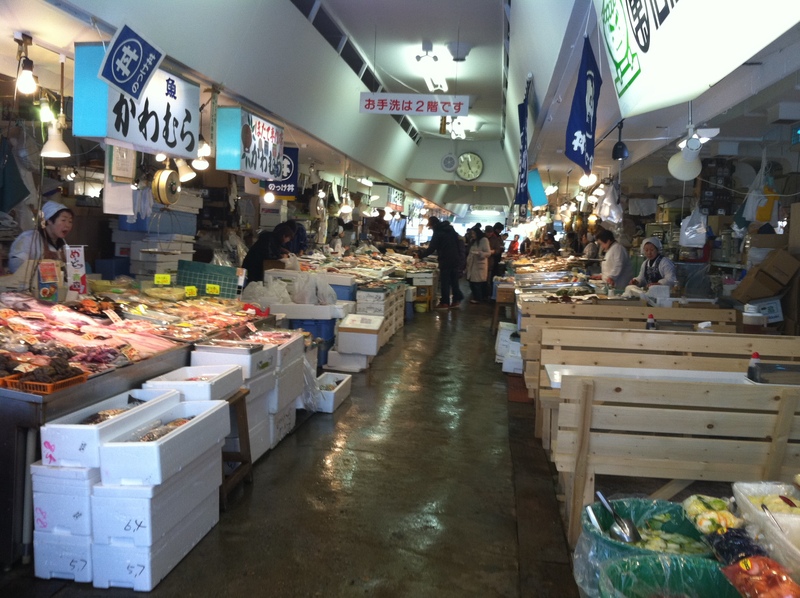 The clue is some chefs of high-class sushi restaurants in Aomori purchase ingredients from this market. So we can actually eat great quality Sushi Bowl with a wholesale price! One of my co-workers said she wanted to come to this fish market for lunch every week. 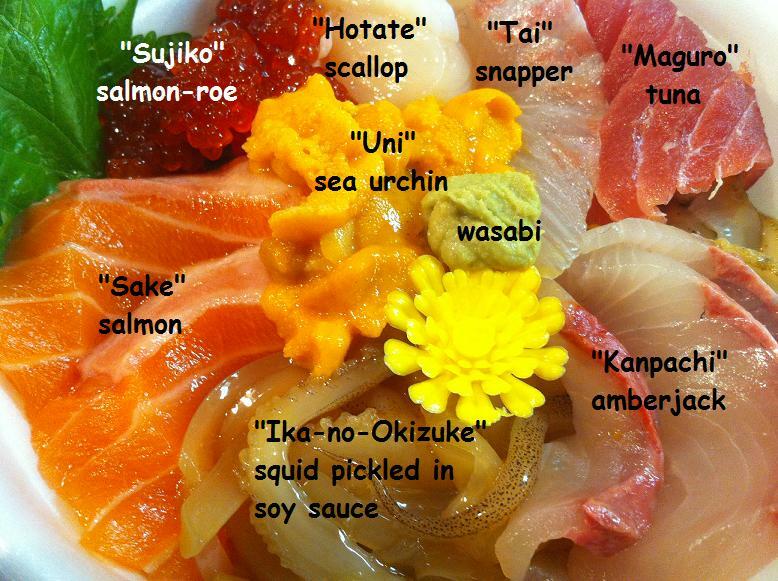 This Make-your-own-Sushi-Bowl is called “Nokkedon” and it is definitly worth a try if you come to Aomori-City. 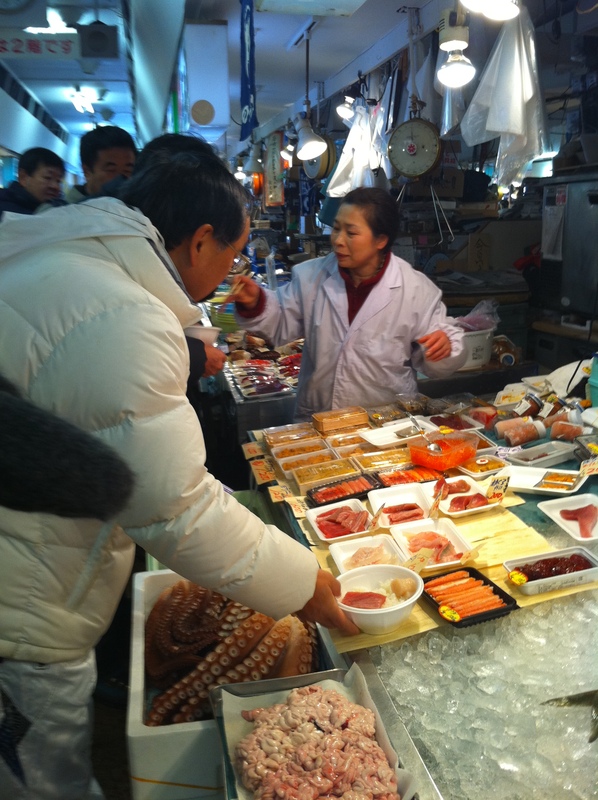 The market is lively and crowded with Japanese tourists even on weekdays. 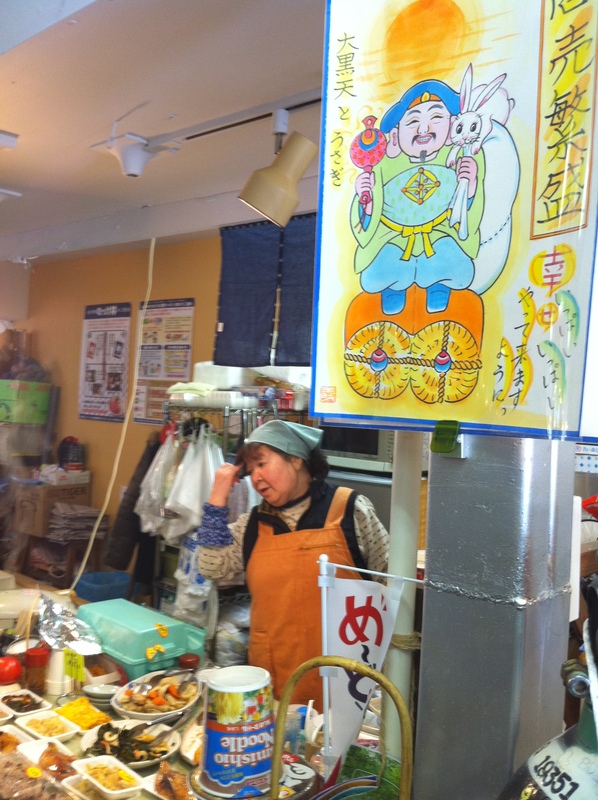 Sellers in Aomori are very kind and not greedy to the tourists, and I bet you won’t be cheated or ignored just because you don’t understand Japanese. Come and enjoy Nokkedon! 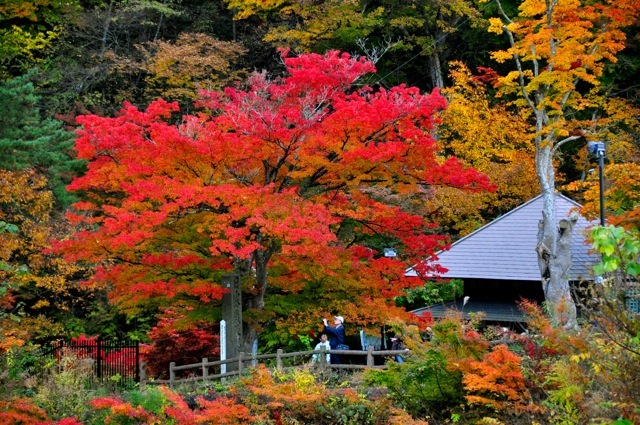 If you are a lover of autumn foliage like myself, then I highly recommend you visit Nakano Momiji Yama in Kuroishi City. 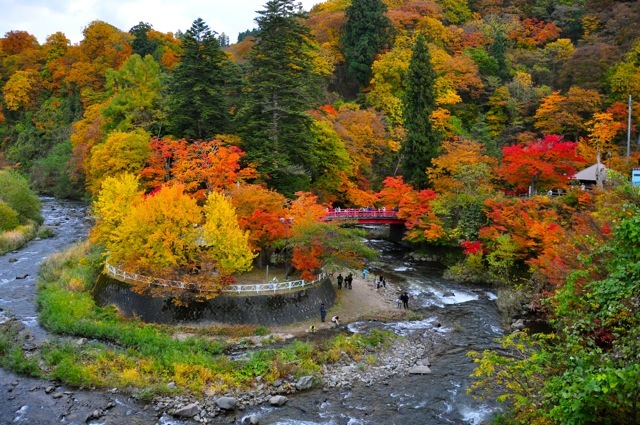 Nestled in the foothills on the eastern edge of Kuroishi, this area attracts lots and lots of leaf peepers and shutterbugs every autumn. Nakano Momoji Yama has been home to over 100 different varieties of Japanese maple since they were brought from Kyoto by the Tsugaru feudal lord in 1802. It envelopes the Nakano Shrine, which is also home to several amazingly large cedar trees aged from 500-700 years old. It is also has some hiking trails offering great views of the surrounding mountains and areas. 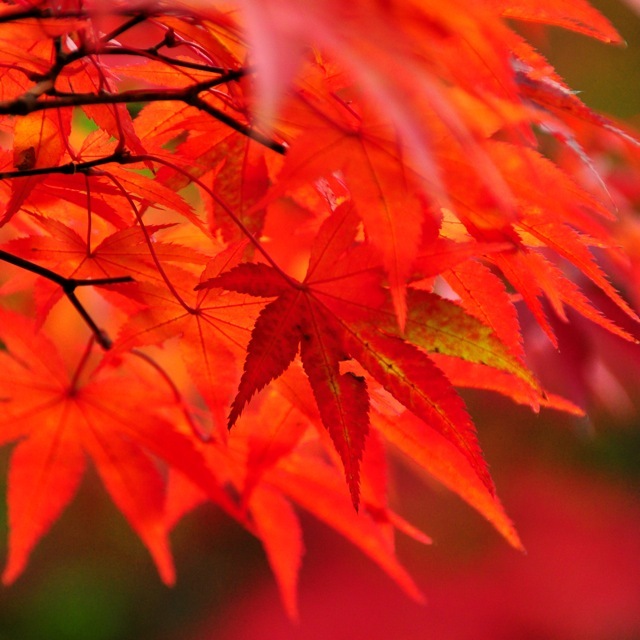 They also light up the lovely maple trees at night, making for a truly breathtaking sight. (Unfortunately I haven’t seen it at night myself). Another great thing about Momiji Yama is that you can spend anywhere from 30 minutes to a few hours depending on how much time you have. 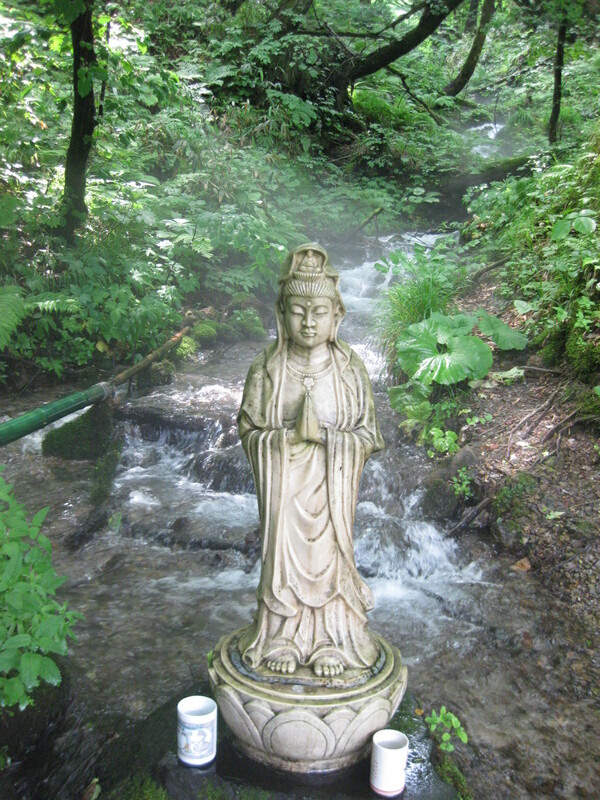 A visit to the shrine or hiking the trails is a great choice if you want to truly take your time and see everything. 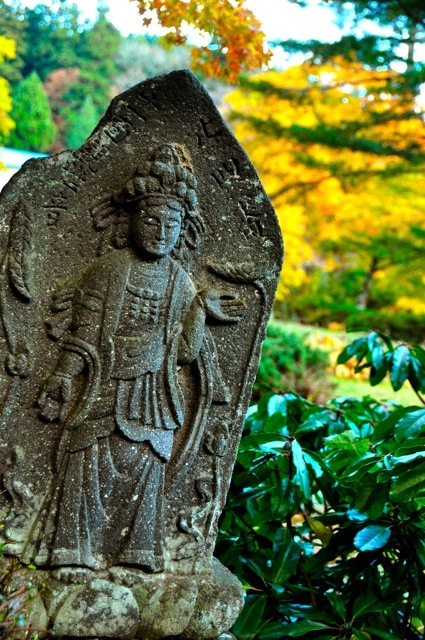 Once you are done, and if it is still light out and you still have some space left in your camera’s memory card, then there is another hidden gem close by to Momiji Yama… a Buddhist temple famous for it’s zen coffee- Josen-ji Temple. A temple of the Jodo or Pure Land Sect of Buddhism, Josen-ji was founded in 1824 after a Buddhist monk by the name of Zeku had a vision of the Buddha during his training instructing him to come to this secluded mountain area and create a quiet retreat for monks to devote themselves to their training. Since its founding, the temple has also served as a “Terakoya”, or place of learning to educate children how to read and write, do arithmetic, and learn about Buddhist teachings before public schools were established in Japan. 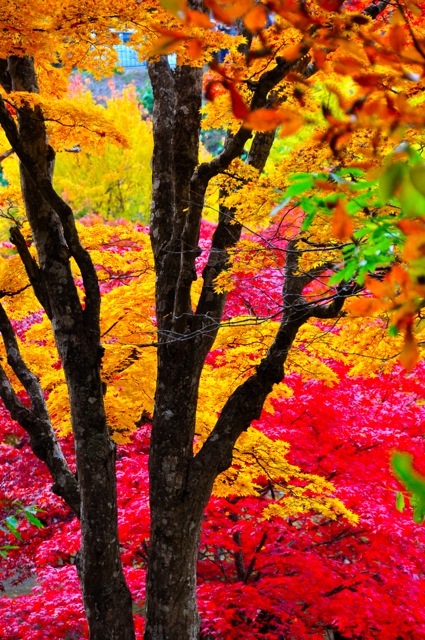 Completely different from Momiji Yama and its slightly crowded atmosphere, Josen-ji offers an even more Japanese autumn experience. 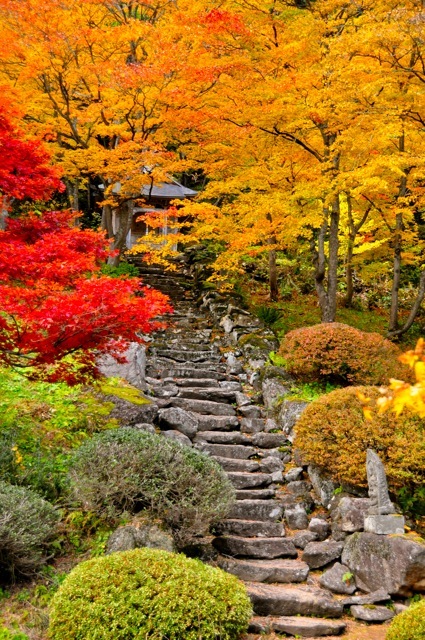 The mountains surrounding the temple were deep with fiery hues of scarlet and ruby on golden oranges and yellows in an eerily silent surrounding. 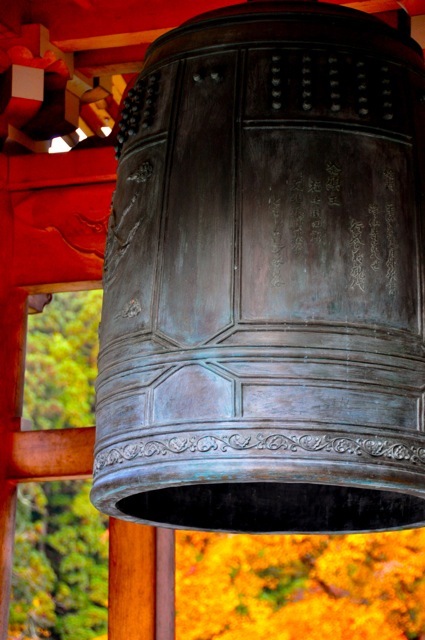 From the silence the temple bell’s low vibrating song echoed up and down the mountainside until once again falling silent in a fleeting instant, reminding me of a Buddhist vision of paradise. I suppose the most out of place thing at this temple would have to be its famous coffee. One would think that green tea would be more fitting, but the priest here brews one amazingly contemplative cup of coffee that somehow works and compliments the beautiful temple grounds and warms up visitors in the fresh cool mountain air. 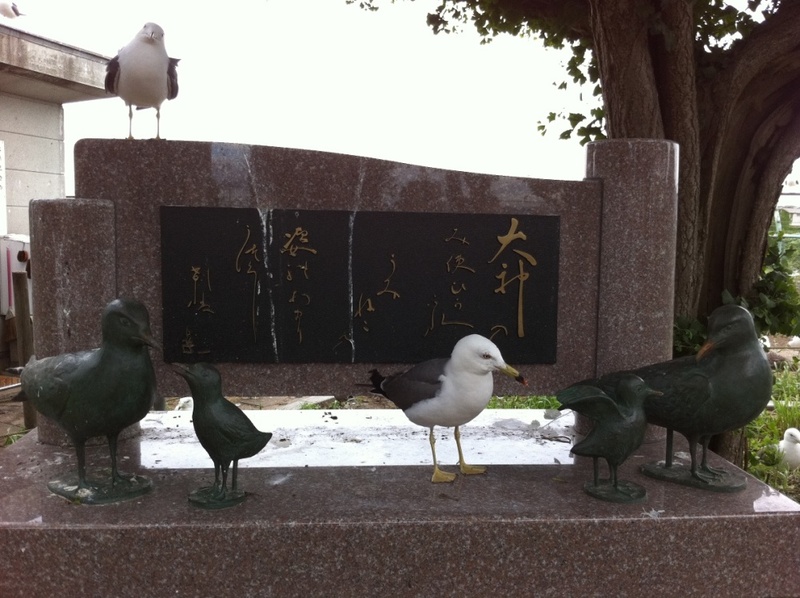 Have you heard about the Kabushima Island in Aomori-Prefecture? It is the only place you can closely view the seagull’s nests and their caring of baby birds in Japan. I visited there in June, the most lively season of the Kabushima Island. 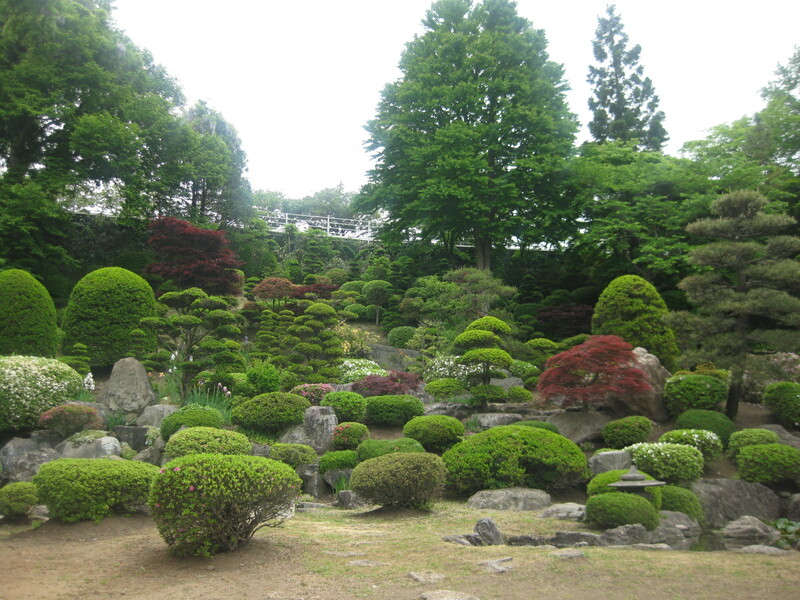 Please enjoy the following images, one of the popular tourist spots in Hachinohe-City. 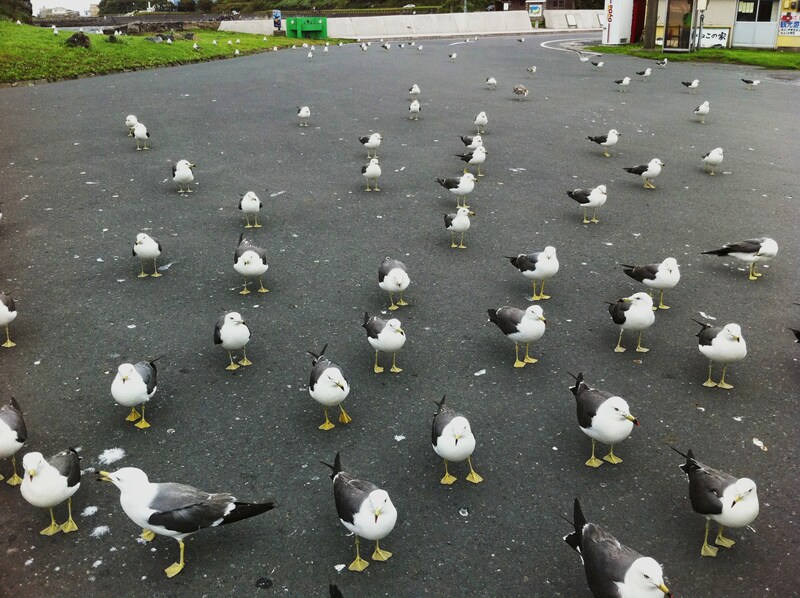 First, seagulls welcome you like this at the parking area……..wow. Can you see the white dots on the grass? The dots are all seagulls, and the total number is said to be THIRTY-THOUSAND!! Kabushima is a small, uninhabited gourd-shaped island 0.8 kirometers in circumference. 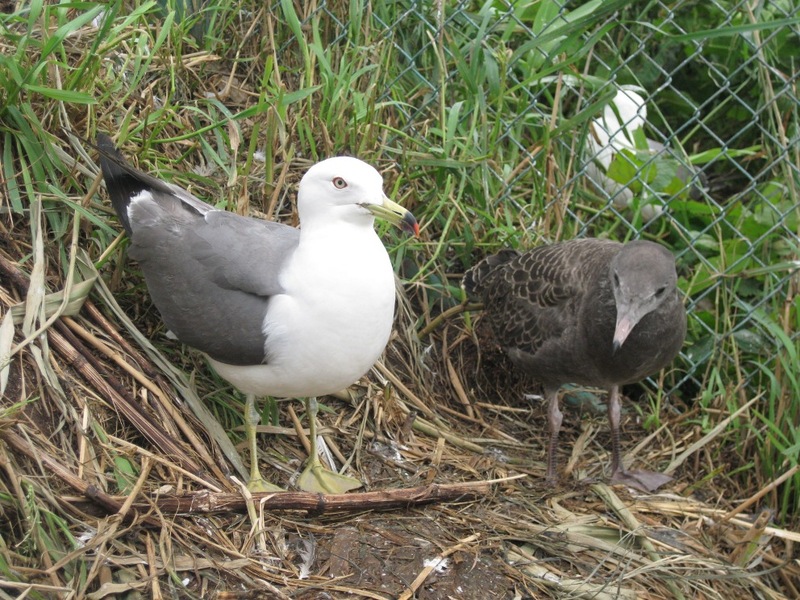 Every year they migrate to this island in early March and start breeding. 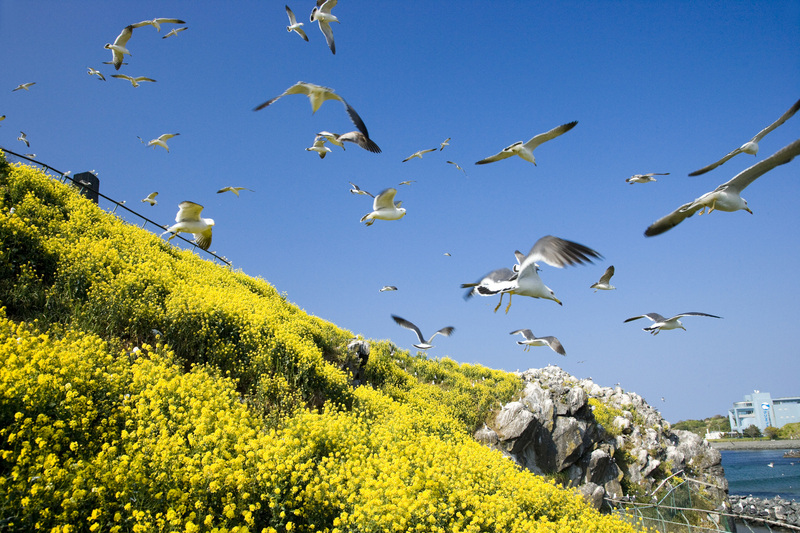 When eggs hatch in June, the rapeseed flowers are in full bloom on the island. Parents and baby seagulls squawk, they fly around all the time, and the sound of ocean waves and winds make the area so lively (or noisy). I just love the way seagulls standing still, all facing to the same direction……. 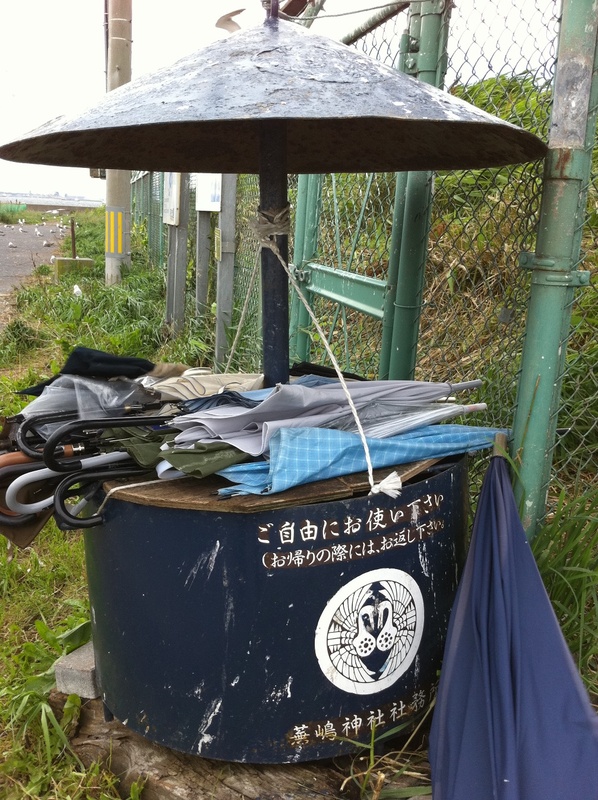 By the way, can you guess what these umbrellas are for ? The answer is to protect yourself from the dropping of seagulls!!! 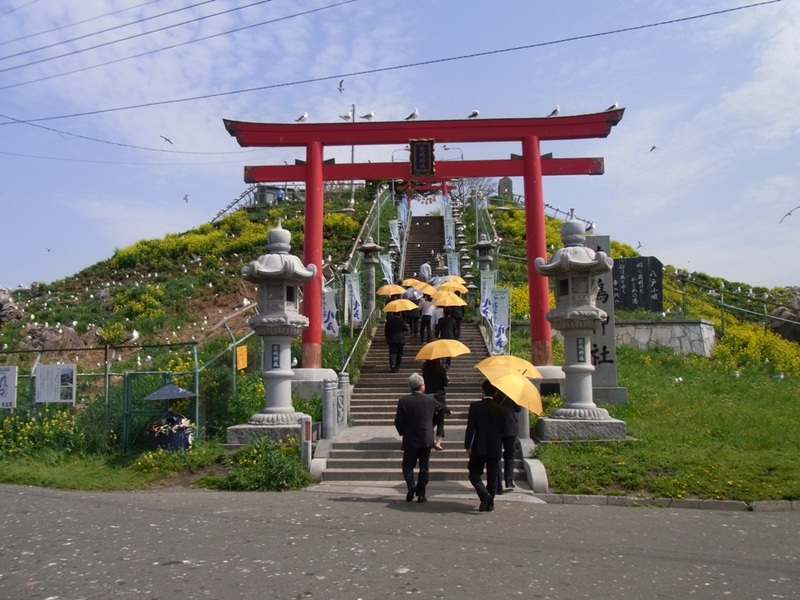 There is the Kabushima Shrine on the top of the island, and visitors and tourists pass through the red Trii gate and go up the stairs with umbrellas. On the way climbing up the stairs, many nests and seagull families can be viewed. 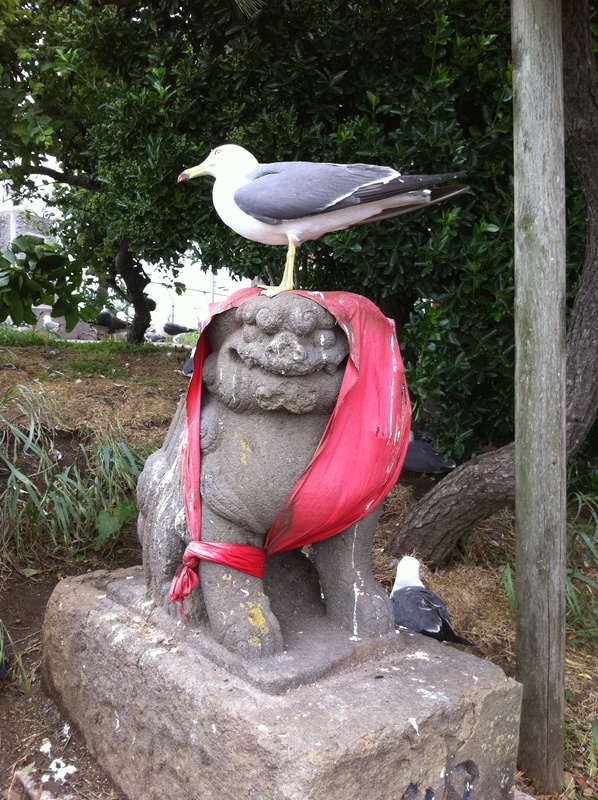 Seagulls protect the shrine with gardian lions. Seagulls are regarded as the messengers of the sea goddess among fishermen, since seagulls tell where the schools of fish are in the water. 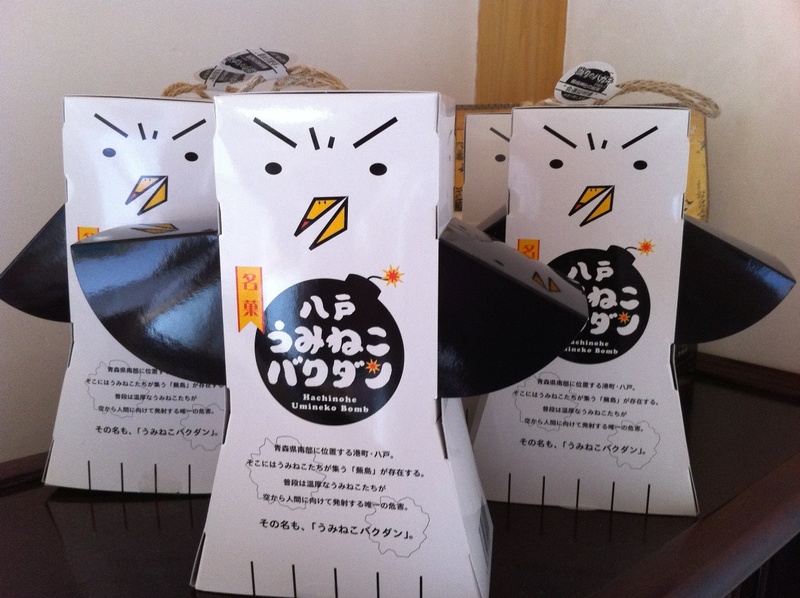 The new candy featuring seagulls started to be sold from this year. The name is “Umineko Bakudan”, literally “seagull bombs” in Japanese. Candies in the shape of seagulls droppings can be taken out from the back of the box seagull….can be good for the souvenir. Now seagulls are all gone migrating south, so please come to Aomori next summer to enjoy this amazing view in Hachinohe. Oh please let me tell you about the omen believed in Japan. “Droppings” and “fortune” have the same pronunciation in Japanese. 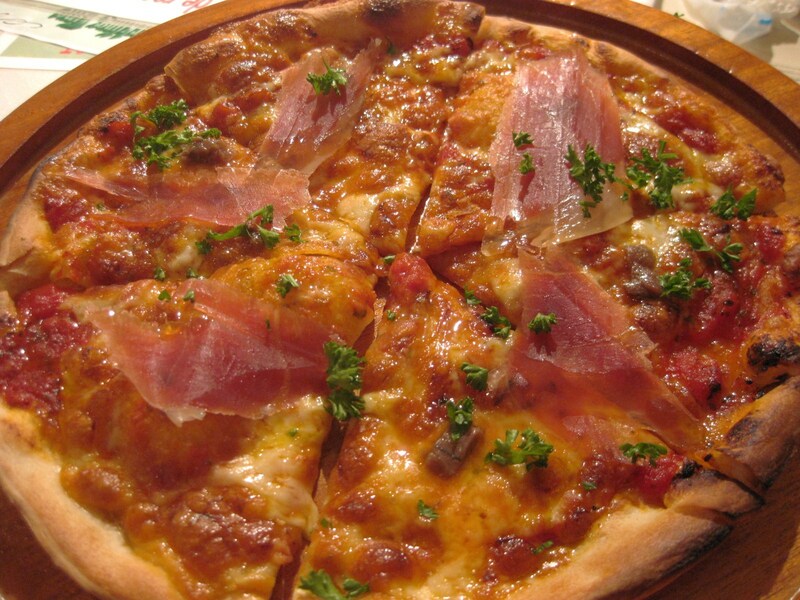 What are the important factors in choosing a restaurant for you? 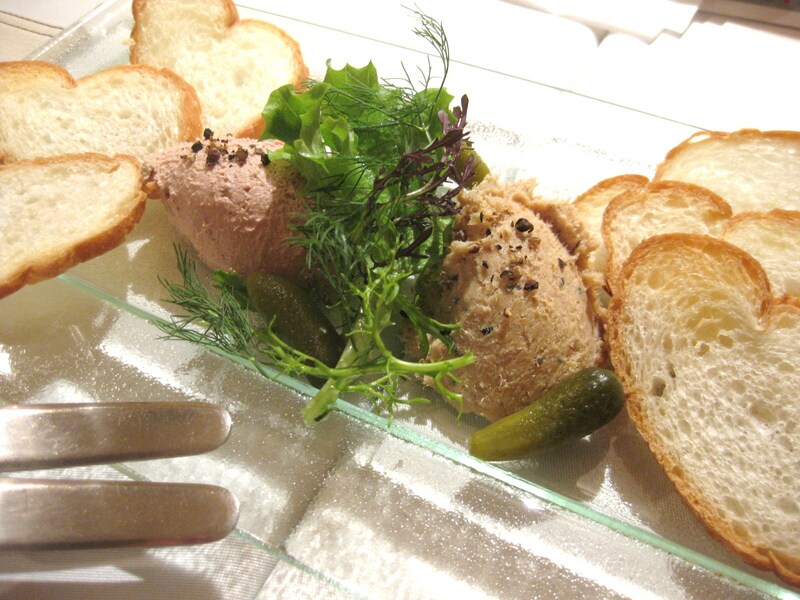 If you like a restaurant serving delicious & beautiful dishes still the price is reasonable and offering a comfortable atmosphere, then you would like “Villa”, the french-themed restaurant in Aomori-city. I organized a small pre-wedding party for my friends (both bride and grooms were my friends) and I picked up Villa. I don’t know much about wine and always ask for their recommendation. 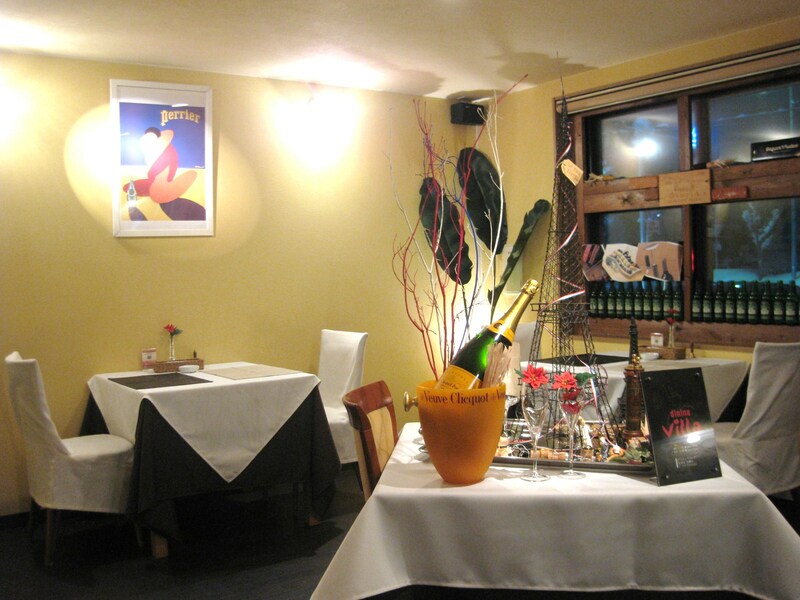 The waitress was very friendly and all wine(rose sparkling, white and red) she recommended were tasteful. Forgot the name…(sorry!) 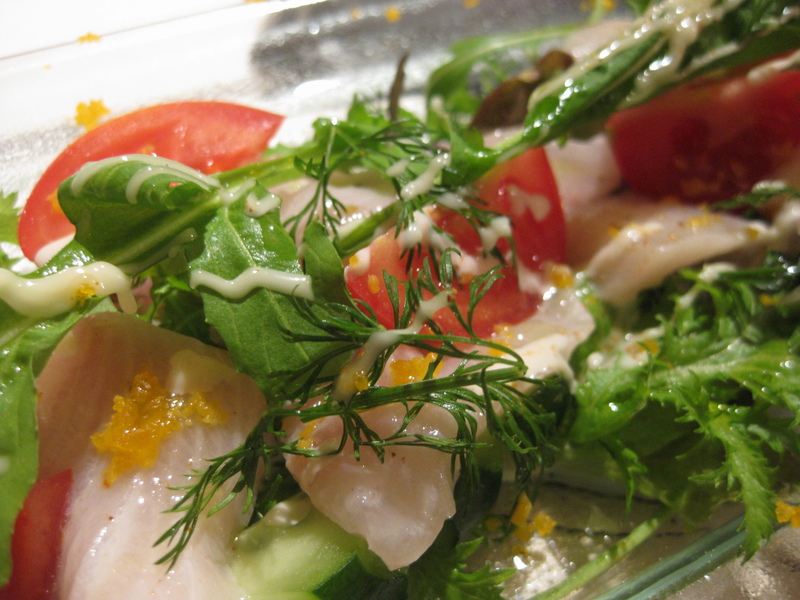 Fish and Salad, the yellow topping is botargo. 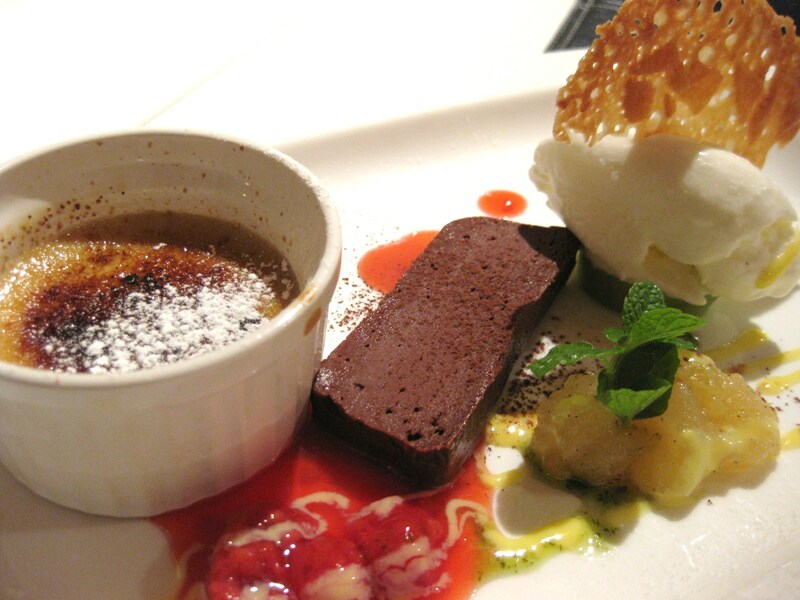 Like many foreign food restaurants in Japan, Villa’s chef is Japanese and probably the taste is a bit acclimatized for Japanese customers. 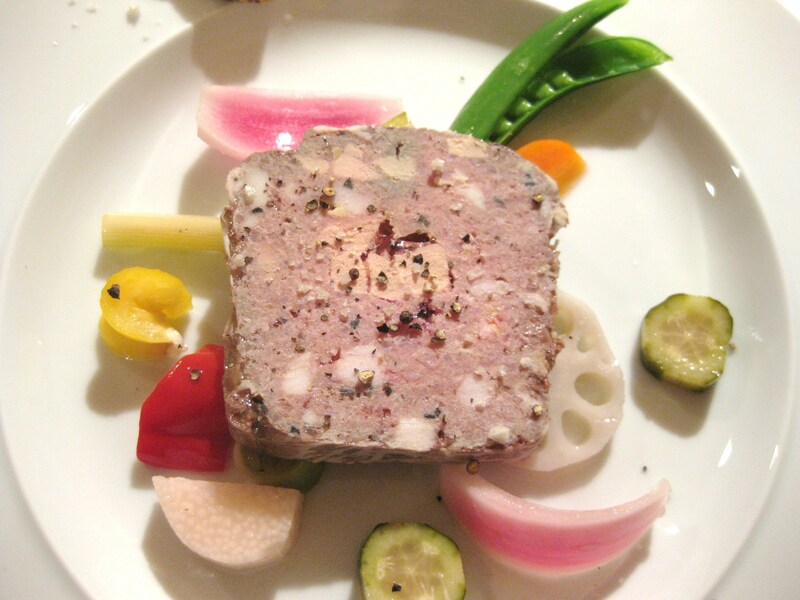 After enjoying Sushi, Tempura and Sukiyaki in Japan, trying French-themed dishes with “chopsticks”(*they also offer forks and knives- it’s your choice ) can be a good experience in Aomori/Japan. Some people who visited this blog asked me if the current header image was taken in Aomori-prefecture. The answer is “YES”, and I am excited to share the beautiful images of Lake Juniko with you this time! Juniko is literally 12 lakes, collective term of 33 small and large ponds created by the big earthquake about 300 years ago. If you want to tour all 33 ponds, it will take all day long and you would need a car. However, visiting major ponds and forest area along the hiking trail will take just about 1 hour. The following are pics I took in 1-hour-tour. My starting point was “Kyororo”, a gift shop near the major ponds. This is the map of Juniko, and my 1-hour-tour course is marked bold on the upper right side. 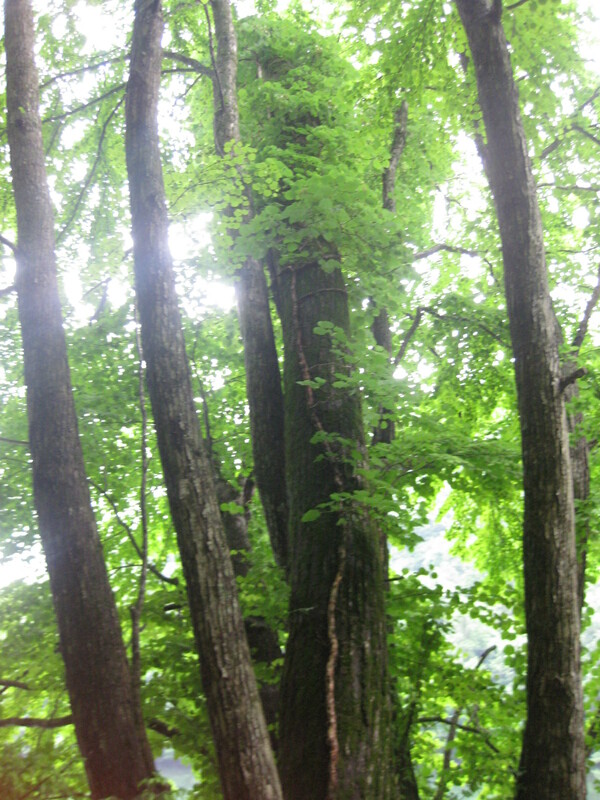 Walking in the forest of Katsura, beech and oak is so refreshing. 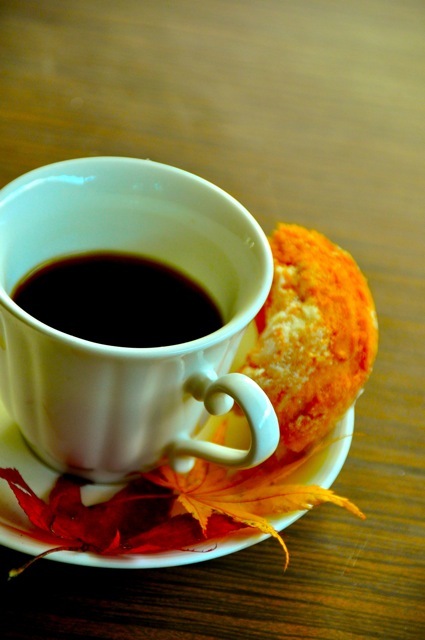 You hear nothing but your footsteps and birds chirping….. 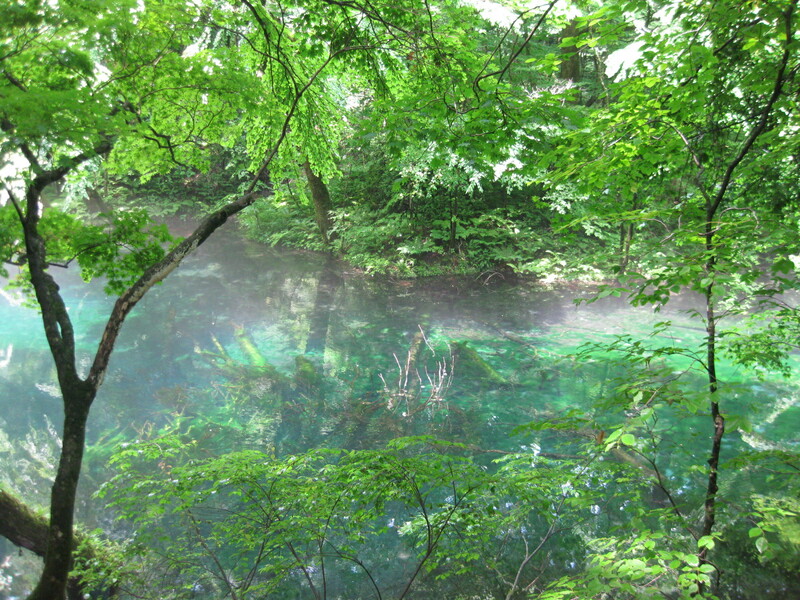 This is “Aoike” pond, known with its mystic crystal blue.The color of Aoike pond easily change by the weather and season. When I viewed this pond, the sunlight brightened the pond and the color was like opals. This transparent blue pond shows us all things under the water. I could see some small fish swimming in there. The air was clean and the fresh woody smell was relaxing. I heard there were some uncommon birds like Ruddy Kingfisher you might be able to see, so I tried to find them carefully but couldn’t find any this time. 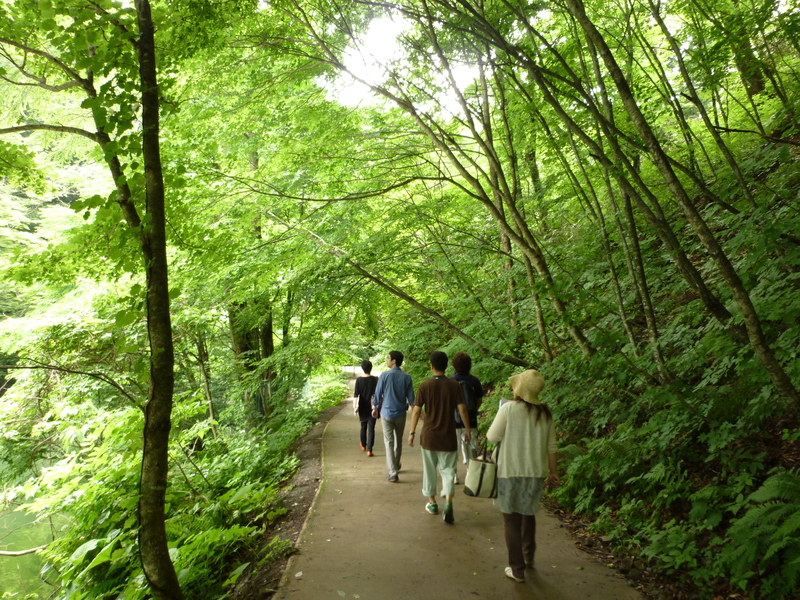 The women walking several footsteps behind the group is me, because I wanted to enjoy strolling slowly. 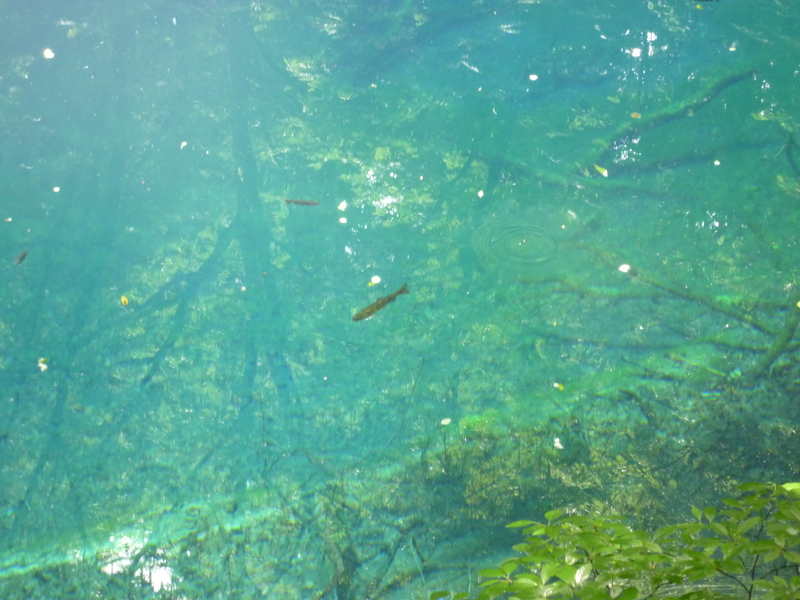 Here is my another favorite pond, “Wakitsubo” – the header image of this blog! I didn’t edit the images, not even a bit. These are what I simply took with my compact digital camera. It was amazingly beautiful. I remembered about the tale of swan maiden, and thought fairies would choose this place for bathing. After going down the long stairs, you will find a small rest area. This place serves you a Japanese small sweet and Matcha green tea made of “Wakitsubo” spring water. I loved it! The lady who makes tea for you wouldn’t give you a bill. There is a box inside of the building and you put money in it. The money will be used to keep the spring water clean and pure, and you can decide how much you want to offer. Recently I’ve been very busy and was worn out, but Lake Juniko definitely helped me to recharge my batteries. Currently there is not much information about Lake Juniko in English, but if you are a nature lover, it’s worth visiting Lake Juniko!